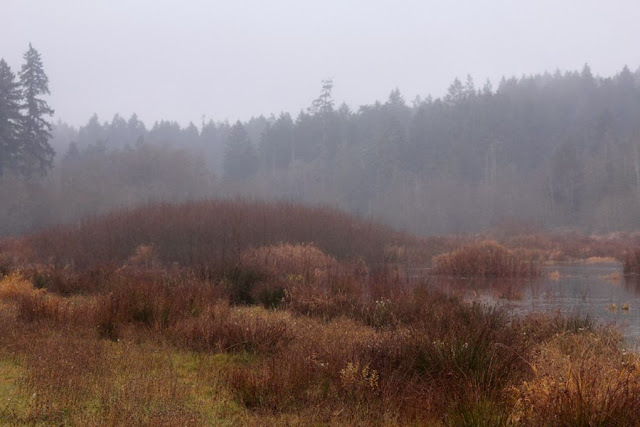 I had to run an errand today at Red Barn Market on West Saanich Rd., so I decided I would step out and check Tod Creek Flats while I was at it. My intention was to quickly scan over the flats and then continue on to Mount Newton Valley to see what I could dig up there. In reality, I spent around an hour and a half at Tod Creek Flats and had very little time for birding elsewhere. When I got out of the car at the Red Barn, I just grabbed my binoculars and wandered down through the opening leading to the flats. 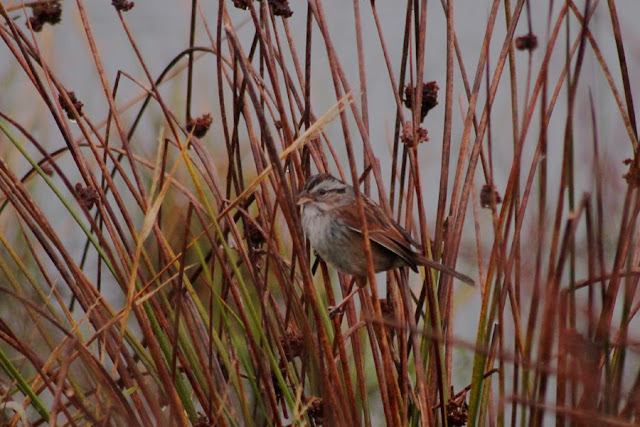 A couple minutes later, I found myself heading back to the car to get my camera because a Swamp Sparrow popped up along the shoreline in the weedy vegetation. As I made my way back to where I had initially seen the Swamp, I noticed there were several sparrows in the weedy vegetation. The clumps of rushes and weedy vegetation must provide a good combination of food and cover because there were a half dozen Song Sparrows and, as I was very surprised to find, at least five Swamp Sparrows! Swamp Sparrows are found in low numbers every winter - usually it's just one or two at Swan Lake and another at either Viaduct Flats, Panama Flats, Rithet's Bog, or perhaps somewhere near Martindale Flats. This year has been exceptional for them so far: one at Rocky Point, three at Swan Lake, three at the Cowichan Bay Dock Rd., and one at Panama Flats. Add the five I had today at Tod Creek Flats and you can see we have a pretty good total locally. 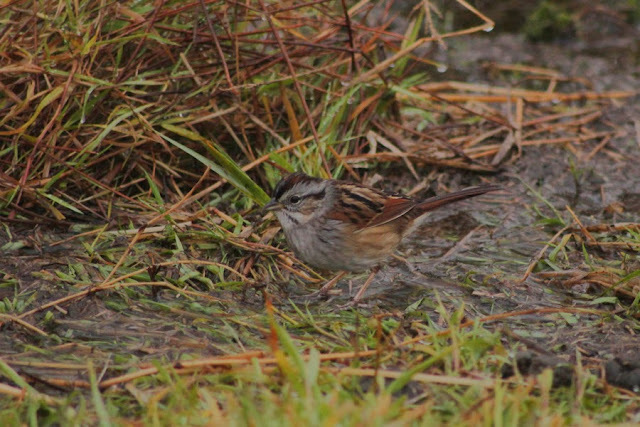 In all my years of birding in the Victoria area, this sighting is easily the best for Swamp Sparrows. There have been occasions where I've seen two individuals at one location, but having five in one small stretch of shoreline was incredible! I may have to go down there again to see if I can determine whether my count was low. Hopefully anyone who has had trouble catching up with Swamp Sparrows locally can head on down to Tod Creek Flats and see at least one or two of the relatively cooperative bunch.